Book Alex Dixon for 30 minute or one hour sessions for teachers, administrators, health-care professionals, or students who want to be inspired to live their lives to the fullest potential and to support others to do the same. Alex provides experience-based examples of how to stay motivated through a major productive struggle. She is supported in her talks by her mother, Juli K. Dixon, well-known speaker and author in mathematics education. Jessica Dixon is also available to co-present providing her unique perspective as a sibling supporting a family struggling with severe medical issues. Juli, Alex, and Jessica provide a unique perspective on how to support each and every student, even those with special needs, to learn mathematics and succeed in school. Learn how to help all students reach their potential, the social interaction issues those with special needs face, a new perspective of using UDL for mathematics, and how small group instruction allows you to differentiate instruction for both remediation and enrichment for students who are gifted and for those with special needs. Juli, a university mathematics educator, provides the viewpoint of both the educator and the parent of children with special needs. Alex, in her third year in college, shares her story related to both medical and educational struggles. Jessica, a college freshman majoring in neuroscience and statistics, provides the position of both the sibling and student with a disability and connects her experiences as a high achiever to a new perspective on Universal Design for Learning. What if we redefined success? Juli, Alex, and Jessica provide a unique perspective on how to support each and every student to learn. Juli, a university mathematics educator, provides the viewpoint of both the educator and the parent of children with special needs. Alex, a college freshman, shares her story related to both medical and educational struggles. Jessica, a high school junior, provides the position of both the sibling and student with a disability and connects her experiences as a high achiever to a new perspective on Universal Design for Learning. Juli, Alex, and Jessica provide a unique perspective on how to support ALL students to learn. Juli, a university mathematics educator, provides the viewpoint of both the educator and the parent of children with special needs. Alex, a college sophomore, shares her story related to both medical and educational struggles. Jessica, a high school senior, provides the position of both the sibling and student with a disability and connects her experiences to a new perspective on Universal Design for Learning. Juli, Alex, and Jessica provide a unique perspective on how to support ALL students to learn. Juli, a university mathematics educator, provides the viewpoint of both the educator and the parent of children with special needs. Alex, a college freshman, shares her story related to both medical and educational struggles. Jessica, a high school junior, provides the position of both the sibling and student with a disability and connects her experiences to a new perspective on Universal Design for Learning. Juli, Alex, and Jessica provide a unique perspective on how to support ALL students to learn. Juli, a university mathematics educator, provides the viewpoint of both the educator and the parent of children with special needs. Juli Dixon shares five essential instructional shifts that emphasize the mathematical practices and the content they support. Participants engage with high cognitive demand tasks and how to support all students to engage with them during instruction. Participants enhance understanding of the shifts through the use of authentic videos as well as through Alex's perspectives on supporting learners who struggle. Alex, a college freshman, shares her story related to both medical and educational struggles. Jessica, a high school junior, provides the position of both the sibling and student with a disability and connects her experiences to a new perspective on Universal Design for Learning. Juli Dixon shares five essential instructional shifts that emphasize the mathematical practices and the content they support. Participants engage with high cognitive demand tasks and how to support all students to engage with them during instruction. Participants enhance understanding of the shifts through the use of authentic videos as well as through Alex's perspectives on supporting learners who struggle. Juli, Alex, and Jessica provide a unique perspective on how to support ALL students to learn. Juli, a university mathematics educator, provides the viewpoint of both the educator and the parent of children with special needs. Alex, a college freshman, shares her story related to both medical and educational struggles. Jessica, a high school junior, provides the position of both the sibling and the subject and connects her experiences to a new perspective on Universal Design for Learning. Students with special needs are often taught through key words and direct instruction. Learn from a student with special needs how key words and direct instruction were replaced with teaching for understanding in an inclusive environment. Explore extensions to these best practices to support increased mathematics achievement for all students. At age 12 Alex suffered a massive stroke during brain surgery. Now 18 and a college freshman at UCF, Alex shares her story and describes her amazing recovery. She provides a personal account of strategies for supporting rehabilitation after stroke. Juli, Alex's mother, provides the prospective of both an educator and caregiver in supporting those with disabilities to reach their full potential. Effective administrators are the instructional leaders in their schools. Successful leaders of mathematics teaching must know what to look for and promote in instruction. Explore six essential expectations for effective mathematics instruction that emphasize the mathematical practices and the content they support with the purpose of increasing student achievement for ALL learners. The Dixons provide a unique perspective on supporting ALL students to learn. Juli, a professor at UCF provides the viewpoint of a parent of children with special needs. Alex, a college freshman shares her story related to educational struggles. Jessica, a high school junior provides the position of a high achieving student with disabilities. Students with special needs are often taught exclusively through direct instruction. Learn first-hand from a student with special needs how direct instruction was successfully replaced with teaching for understanding in a discourse-rich environment. Explore extensions to these best practices through a video exploration of important teaching shifts to support increased productive mathematical discourse for ALL students. Learn from the authors and the main character of this true story how a massive stroke can be thought of as lucky. Alex provides firsthand look into her journey from normal child, through a stroke, and back again. Jessica shares her perspectives as the younger sister through her ordeal, and Mom - Juli - provides the mother's perspective of this harrowing experience. Pediatric Interest Group (PIG) has a mission to educate medical students about the science and art of pediatric medicine through speaker events, interactive medical opportunities, and community service. Involvement in PIG can help remind medical students about their passions in pursuing a career in medicine. Hearing the stories of physicians and patients alike inspire students, especially during the first two years of medical school when patient experience is limited. In this session, Alex Dixon will share her experiences from looking for answers regarding an unexplained illness to how she managed her recovery from a massive stroke at age 12. Jessica Dixon will share her perspective as Alex's younger sibling. The book, A Stroke of Luck, will be available for purchase following the talk. Students with special needs are often taught exclusively through key words and direct instruction. Learn first-hand from a student with special needs how teaching key words and direct instruction were successfully replaced with teaching for understanding in an inclusive environment. Alex Dixon was a normal, bright, healthy girl, when a sudden onset of a mysterious illness took over her life. Months of treatments failed to provide relief from acute pain and muscle spasm. Brain surgery stopped the spasms but caused a massive stroke. Alex had to relearn everything. Alex provides a personal account of strategies for supporting a student with special needs to learn mathematics with depth. Alex's mom, Juli Dixon, a professor of mathematics education, shares her perspective on what worked for teaching students with special needs. In this motivational session, Alex shares how her drive combined with high expectations from those surrounding her allowed her to beat the odds and become a productive citizen. Jessica provides the too often overlooked sibling’s perspective on life in a family supporting a child with special needs, and Juli offers suggestions for parents to help navigate to a successful outcome. Alex and Juli will share strategies they used at home as well as in school to support Alex and encourage her to reach her full potential. This presentation is both motivational as well as purposeful. In this motivational session, Alex shares how her drive combined with high expectations from those surrounding her allowed her to beat the odds and prepare to graduate with distinction. She discusses strategies that were successful for her and provides suggestions for supporting others to have the same success. All who participate will find themselves reflecting on how to live their best lives while supporting others who might need their support to do so as well. Alex Dixon shares her story of recovering from a massive stroke. She provides suggestions for living your best life. Sister, Jessica Dixon, discusses strategies for being successful and supporting others to do the same. Alex says, “it took a stroke and a coma but now I like math!” Students with special needs are often taught exclusively through key words and direct instruction. Alex, who has special needs, and her mother Juli Dixon share how they successfully replaced key words and direct instruction with teaching for understanding in an inclusive setting. Alex, Jessica, and Juli share Alex's story and how it is truly the story of an entire family. Critical illness, in this case, and illness that led to a stroke and disability, impact every member of the family. Alex, Jessica and Juli will provide suggestions for how social workers can become part of a supportive village for the entire family. Students with special needs are often taught exclusively through key words and direct instruction. Learn first-hand from a student with special needs how key words and direct instruction were successfully replaced with teaching for understanding in an inclusive environment. Narrative medicine is a student interest group focused on bringing the human angle of medicine to the medical school experience. This is done through storytelling – sharing experiences of peers, patients, and clinicians through the written word, live talks, and visual media. Past events include film screenings and discussions, storytelling events with physicians and patients, and book readings. These casual meetings serve as a break from the medical school grind and a reminder of why the goal of becoming doctors. In this session, Alex Dixon will share her experiences from looking for answers regarding an unexplained illness to how she managed her recovery from a massive stroke. Jessica Dixon will share her perspective as Alex's younger sibling. The book, A Stroke of Luck, will be available for purchase following the talk. Students with special needs are often taught key words and through direct instruction exclusively. Learn first hand why Alex Dixon - a student with special needs - says, "it took a stroke and a coma but now I like math!" Alex and her mother, Juli Dixon, describe how teaching key words and direct instruction were replaced with teaching for understanding in an inclusive environment. Alex and Juli will share strategies they used at home as well as in school to support Alex and encourage her to reach her full potential. This presentation is both motivational as well as purposeful. You will be glad you got up early to attend! Alex, Jessica, and Juli share Alex's story and how it impacts each member of the family. They provide suggestions for how social workers can become part of a supportive village. Alex, Jessica, and Juli share their approach for writing for social change. They share how their book, A Stroke of Luck, becomes the tool; their blog becomes the link; and their talks provide the contact to promote the change they want to see in the world. Students with special needs are often taught exclusively through key words and direct instruction. Learn first-hand from a student with special needs how teaching key words and direct instruction were successfully replaced with teaching for understanding in an inclusive environment. Explore extensions to these best practices through a video exploration of important teachers shifts to support increased mathematics achievement for all students. At age 12 Alex suffered a massive stroke during brain surgery. Now 16, Alex shares her story and describes her amazing recovery. She provides a personal account of strategies for supporting rehabilitation after stroke. Alex shares her story of survival along with strategies for supporting people with special needs. Students with special needs are often taught key words and through direct instruction exclusively. Learn first hand why a student with special needs says, “it took a stroke and a coma but now I like math!” and how key word and direct instruction were successfully replaced with teaching for understanding and inquiry in an inclusive environment. This session is co-presented by Alex and Juli Dixon. Alex will share her remarkable story of beating the odds to reclaim her life after a serious illness and tragic accident. Jessica will uncover amazing, candid insights from the point of view of the invisible sibling. Join us for an afternoon that is sure to elicit awe and inspiration. Alex and Jessica will guest lecture in the Health Settings course of the Social Work Program. They will provide their first-hand accounts and perspectives on how best to support persons with disabilities and their caregivers in critical situations. Narrative medicine is a student interest group focused on bringing the human angle of medicine to the medical school experience. This is done through storytelling – sharing experiences of peers, patients, and clinicians through the written word, live talks, and visual media. Some of our past events include film screenings and discussions, storytelling events with physicians and patients, and book readings. Our casual meetings serve as a break from the medical school grind and remind us why we want to be doctors. In this session, Alex Dixon will share her experiences from looking for answers regarding an unexplained illness to how she managed her recovery from a massive stroke. Jessica Dixon will share her perspective as Alex's younger sibling. Statistics are one thing, but it's been proven that there is tremendous power in story. In this session, university faculty will tell our stories, which led to the series of workshops on elder care and caring for a family member with a disability. Whether our stories encourage those in similar circumstances or enlighten those who have yet to travel this road, we hope to bring greater attention to these issues on a University-wide level. A suggested reading list of helpful resources will be provided. See http://womenfaculty.afia.ucf.edu/events/ for more information. During this engaging featured presentation Alex will share her heartbreaking, heartfelt, and hopeful story that will take you on a journey through illness, stroke, and recovery. Alex and her family will discuss how it takes a village to help a sick child and how that village can span generations and countries. Of particular interest is how her current physical/occupational therapy is conducted virtually with a therapist in Israel. 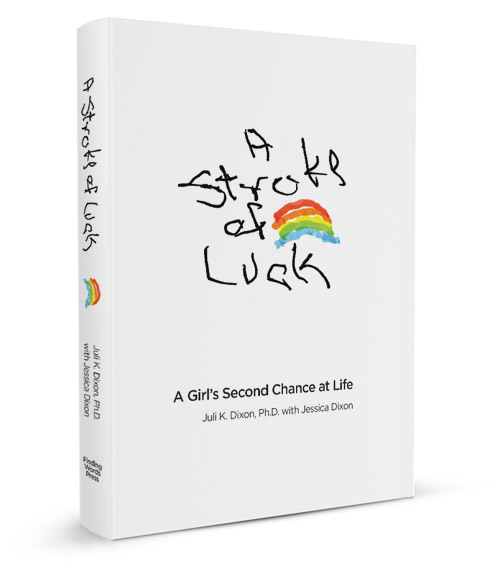 The new book, "A Stroke of Luck: A Girl's Second Chance at Life" will be available for purchase at the event. High school student, Alex Dixon, shares her story of going from gifted to special needs. In addition to hearing her story, learn from a student's perspective suggestions on what k-12 educators can do to ensure a positive and rigorous learning environment for students with special needs. Andrea Walsh, Intervention/Inclusion Specialist, connects Alex's story to research and implications for classroom practices.